The video game industry is poised for long-term growth. 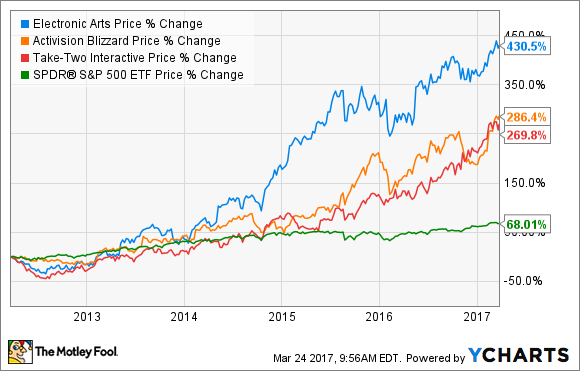 Electronic Arts (NASDAQ:EA), Take-Two Interactive (NASDAQ:TTWO), and Activision Blizzard (NASDAQ:ATVI) stock prices have soared in recent years, driven by the shift to digital distribution of games and content. The growth of mobile gaming, the emergence of e-sports, and digital distribution of games are allowing game companies to expand margins and expand the global audience for gaming. Faster internet connections and online-enabled consoles have been game-changers for video game publishers. Physical sales of games in retail stores are dwindling as gamers choose to download games directly to their console. This new business model of selling digital games and content is performing wonders for game companies' bottom line. The video game industry is $100 billion and growing. Image source: Pixabay. While full-game downloading has been around on PC for several years, it's just now catching on as a mainstream form of purchasing games on consoles like Sony's PS4 or Microsoft's Xbox One. As a result, game publishers are drowning in cash as the need for physical game discs is diminishing and is being replaced with high-margin downloadable content directly distributed to gamers over consoles. Electronic Art's stock price is up over 400% in the past five years as its gross margin has expanded from 63.4% in fiscal 2013 to an expected 72.1% for fiscal 2017 ending in March. EA's cash generated from operations has grown from $324 million in fiscal 2013 to $1.37 billion for the trailing-12-month period. The improvement in profitability stems from growing digital sales of content, including full-game downloading on consoles, sales of additional in-game content, and the growth of mobile games. Further margin expansion is expected since only 32% of EA's unit sales on current-generation consoles are digitally downloaded rather than purchased physically in-store. This parallels Take-Two's 25%-plus current-generation titles purchased digitally. As margins and profits expand, game companies are finding other attractive growth areas within the industry to allocate excess cash to drive future growth. According to SuperData Research, mobile gaming generated $40.6 billion in worldwide revenue in 2016 and grew 18% over 2015. The top three game publishers are beginning to allocate capital into mobile gaming as a way to diversify revenue channels and benefit from the fast growth of the mobile market. Activision Blizzard made a bold move when it bought King Digital Entertainment for $5.9 billion in early 2016. The addition of the Candy Crush and Bubble Witch developer helped Activision Blizzard increase cash flow from $1.26 billion in 2015 to $2.16 billion in 2016. Recently, Take-Two announced the acquisition of mobile game developer Social Point for $250 million. Social Point's revenue has grown 29% per year since 2013 and the company generated $19.9 million in operating income for 2016. Take-Two expects to generate $350 million in cash flow for fiscal 2017 ending in March. EA has put together a portfolio of mobile game studios over the years, giving it access to popular games like Plants vs. Zombies, in addition to mobile versions of its own console franchises. EA's trailing-12-month mobile revenue increased 14% year over year to $626 million. Perhaps the biggest opportunity facing game companies today is the global phenomenon of competitive gaming, or e-sports. Newzoo estimates the global e-sports audience to be 385 million, with e-sports spectators totaling 194 million with the balance being active participants. The number of participants is expected to grow 50% to 286 million by 2020, bringing the total audience to nearly 500 million. The large global audience is a great opportunity for game companies to reach new audiences by designing games with compelling multiplayer competitive game modes. Activision Blizzard, for example, designed Overwatch to specifically appeal to the global e-sports audience. Sports games like EA's FIFA and Madden NFL, as well as Take-Two's NBA 2K are perfect for e-sports as well. The e-sports market has been around for several years, but game companies are only now beginning to actively pursue it as another revenue channel. The bright prospects for the video game industry is also attracting outsiders like Amazon.com, Facebook, and Alphabet to join the action. Facebook has its Oculus Rift virtual reality headset. Amazon and Alphabet offer game developers cloud storage solutions to host mobile games and both are also competing in live game streaming. Amazon has even embarked on a journey of developing games with Amazon Game Studios. These tech giants have clearly noticed the growing audience for e-sports and the high engagement levels demonstrated by gamers. In the fourth quarter of 2016, Activision Blizzard players spent about 43 billion hours engaged with the brand's various game titles. This number is in line with other major entertainment/social media outlets like Netflix. It shows how video games have become a major form of entertainment which bodes well for the industry's future. John covers consumer goods and technology companies for Fool.com. EA Is Making 2 Brilliant Moves With "Star Wars Jedi: Fallen Order"